The Magnetic Light (ML) (TM) series of spotlights and flood lights are MADE IN THE USA and enable the operator to position the light beam and attach the light to any metal surface. 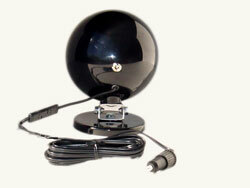 Magnetic Lights (ML) have magnetic mount bases, measuring 3.25 inches in diameter, with 100 pounds of magnetic pull. Magnetic Lights are used as military spotlights, searchlights, utility spotlights, roof mount spotlights, hunting spotlights, work lights and linesman lights. Magnetic Light (ML) will hold their position once the operator places the beam. The operator can adjust the tension bolts to increase or lessen the "position holding" hinge depending on the amount of vibration in the environment. Magnetic Lights can be used on vehicles, boats and heavy equipment. - This 35 watt, sealed beam spotlight emits 1050 LUX at 25 feet and reaches a distance of 390 feet. At its widest point, this light beam will be approximately 75 wide. Like the entire all-glass range, this lamp was designed and built for aircraft landing lights. As a result, the lamp not only produces a bright beam, but it also is resistant to vibration and weather related damage. This particular lamp contains a strong filament covered by a full arc shield. The shield gathers the light from the bulb and focuses it into the reflector of the spotlight. The resulting beam from this spotlight is highly focused. This spotlight is reasonably effective for inclement weather use. This spotlight is popular with utility workers, since linesman and other workers can look into the spotlight without getting the blinding effect from the spotlight. The shield in front of the bulb creates this non-blinding effect for this spotlight. The life of this lamp is rated at 150 hours within a Larson Electronics spotlight. The beam pattern is shaped like a long cigar, with its thickest part a little past the halfway point. This spotlight has a reflective shield directly in front of the bulb. This focuses the light and minimizes the impact of looking directly into the light while working. This spotlight is extremely popular with cable and telephone company installation and repair crews. - 3.25 inch diameter round magnetic base enables the light to be mounted securely to any metal surface. Larson Electronics provides magnetic mount plates to attach to non-ferrous surfaces. These plates enable the use of all the Larson Electronicss and Golights with magnetic bases on any surface, including fiberglass, wood and concrete. These mounting plates are sold separately. - Interlocking aluminum and stainless steel u-brackets secure the elevation of light beam once the operator positions the beam. The operator can tilt the lamp head up and down with pressure from a single hand. The tension on the hinge system will hold the lamp head in place once the operator positions it. This means that the operator can position the light beam at any angle and the light will hold that angle until the operator changes the tilt of the beam. - UV and salt resistant lamp housing measures 6 inches in diameter and 3.5 inches deep. - On/off toggle switch located on the back of the lamp housing controls power to the lamp. - Detachable cord options include 16 foot cord with cigarette plug, 21 foot cord with spring battery clamps, 21 foot cord with 3/8 inch ring terminals, 10 foot coil cord with cigarette plug, 16 foot cord with cigarette plug with on/off switch and 21 foot cord with ring terminals and inline on/off switch. Each Control Light is equipped with a one foot pig tail with 2 pin SAE connector. All cords manufactured by Larson Electronics (www.larsonelectronics.com ) are compatible with the Magnetic Utility Light (MUL) with magnetic base. - 7 year warranty covers all components except lamp. Lamp is easily field serviceable and can be changed within 3 minutes. - MAGNETIC LIGHTS (ML) ARE MADE IN THE USA.